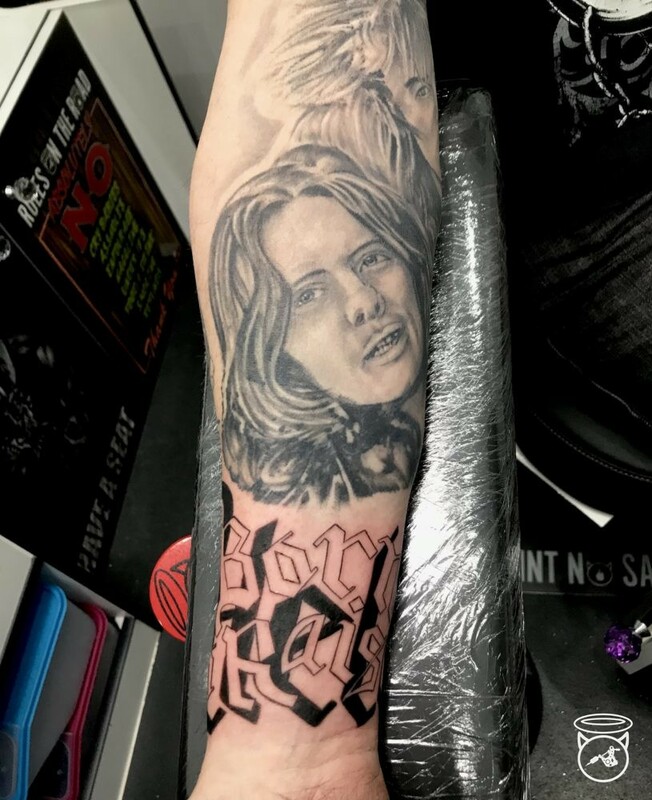 Iaint Nosaint presents his new studio “On The Road Tattoo” fully licensed and now covering the Rickmansworth area. 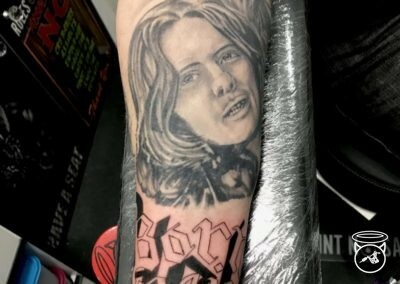 There was a lot of fun to be had on quite a tricky cover up this week. 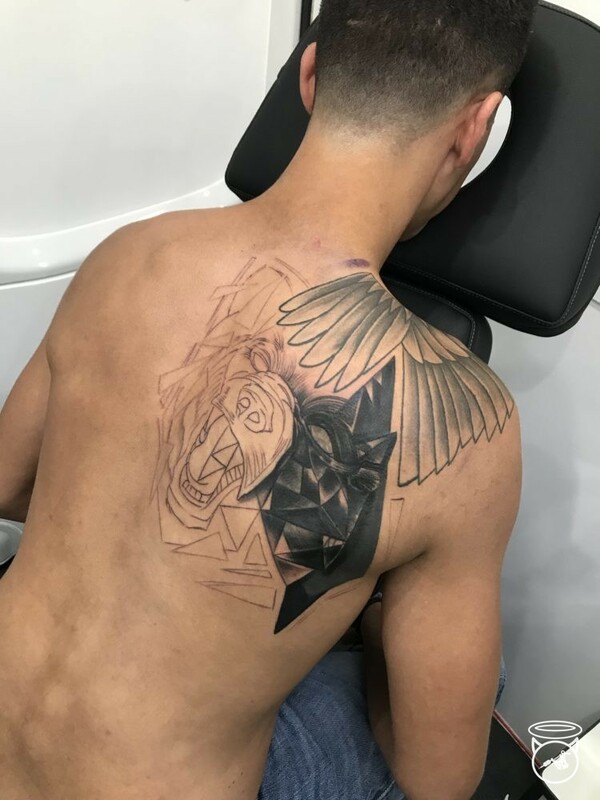 Unless it is going to be extremely straightforward then I tend to freehand my coverups now. My aim is to “save” as much clean skin as possible wherever I can. 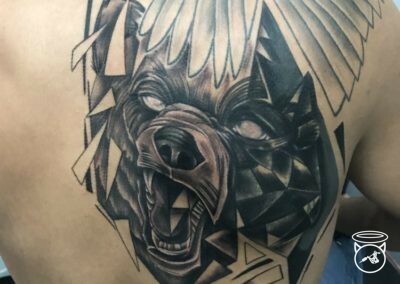 So when we needed to cover a geometric Wolf, we decided to continue to use a geometric theme. So I freehanded a Geometric bear. The reference for this was from another tattoo that the client had seen online. 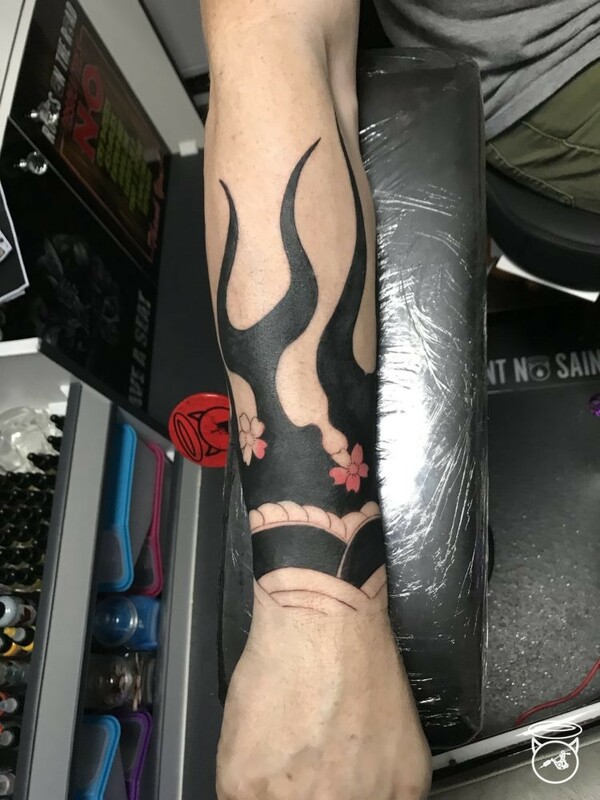 It is a common practice now, instead of sending artwork or photograph’s of the subject matter, people tend to send me a picture of a tattoo and ask “how much for this”? 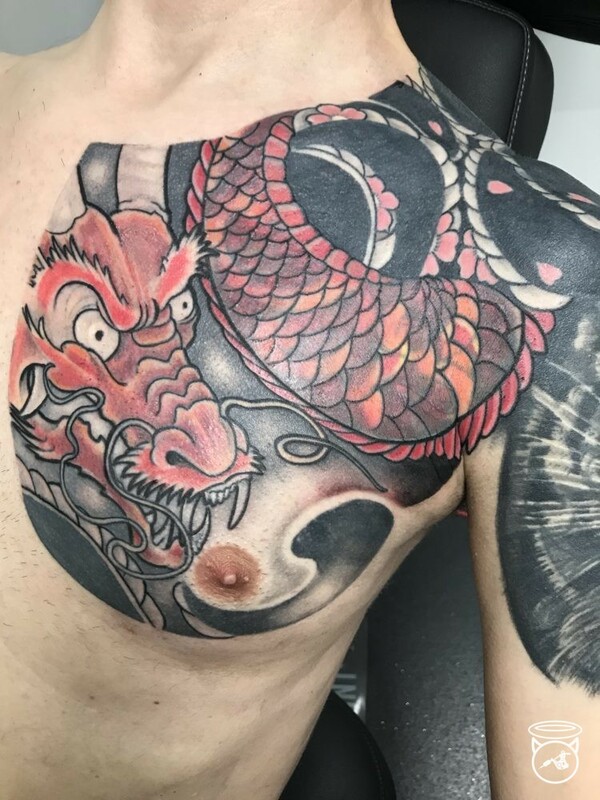 As much as I am tempted to sometimes reply “I don’t know I didn’t do it” I understand that the internet has taken over and it is an easy option to find a tattoo that you really like online. Alternatively you can just throw an idea at me and let me run with it. So given that this was inspired by someone else’s tattoo. 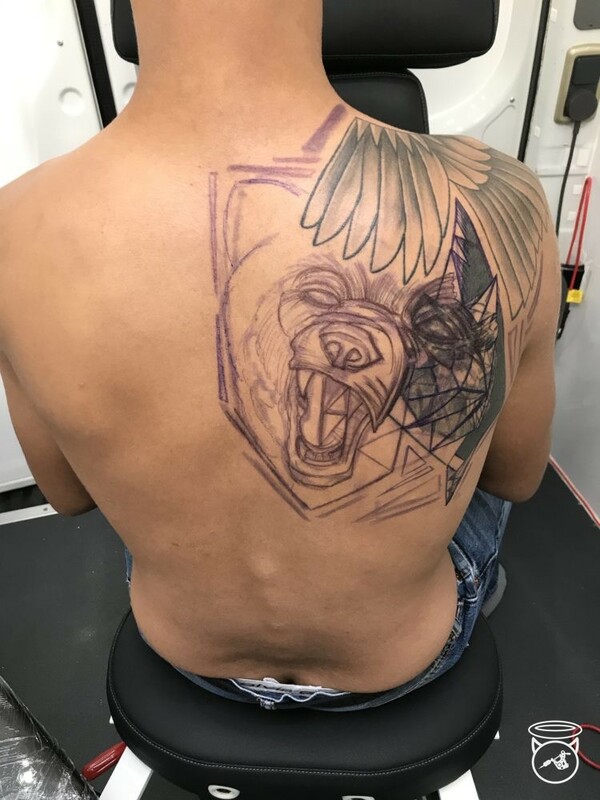 I decided to only look at the original tattoo long enough to freehand the initial sketch on the skin. From there I did my own thing with the outline and shading. 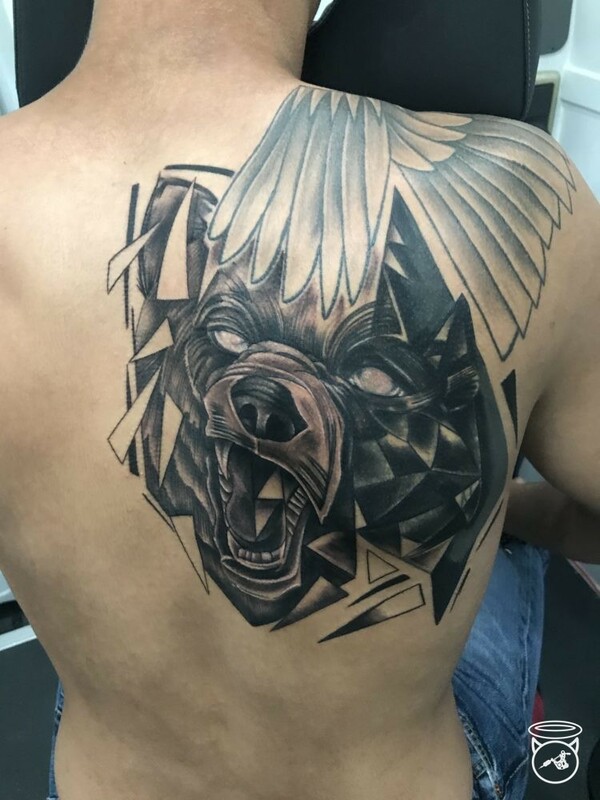 This changes it to a tattoo that was inspired by another but not copied directly from another. Part of the reason the ink goes into the skin well and it is a big part, is hydration. Your body is 80% water. Later in the week I started quite a heavy cover on another regular. 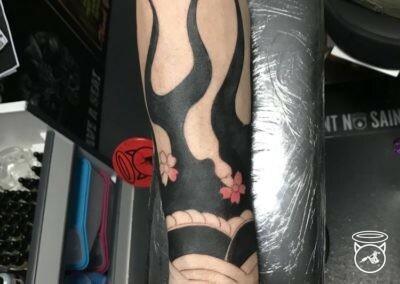 Having done one really tough cover up on one arm already we had some over colourful flames to deal with on the other. With cover ups I try and keep it simple. So we just cleaned up the flames with black and from there we have a sharp line to run into something else on clean skin. Part of the reason the ink goes into the skin well and it is a big part, is hydration. Your body is 80% water. Imagine a fish tank that never got its water changed and imagine your organs are the fish. Then take on board that when you are de-hydrated the body pools all of its water in the core, so the first areas to dehydrate are the extremities, what is the biggest extremity of all?… Skin. If your de-hydrated then your tattoo will hurt more, much more. My second customer of the week uses the no caffeine rule. He dos not partake for a few days before the tattoo. He then sits like a rock. For my own part I need to start practising what I preach and pull my finger back out on the training front. I am feeling pretty fit, weight is good and the Vegan diet makes management quite easy. I may have become a bit lazy when it comes to training and I am most certainly not fully hydrated. Although I am not ready to throw the towel in and say: “I have let myself go”. I think it is certainly time to have a bit of a meeting with myself and push. Enough of distraction and stress I am going to start lifting heavy stuff again. As always I need a goal in order to get going, a target if you like. Circumstances and an empty piggy bank means that a holiday is out of the question. 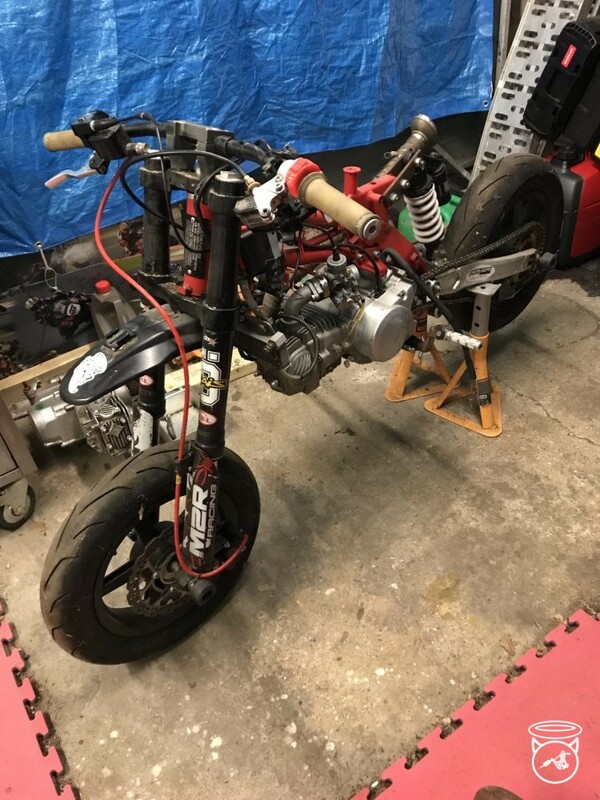 So instead I am going to call in a couple of favours which will in turn cost me a couple of favours, get my pit bike rebuilt and do a few track days. I have no plans to race again…… must… not…. go…. racing. New Brembo brakes on the truck are stunningly good and I am overjoyed with the straightforward service at J DEP Motors in Bedmond. The truck is back in for a full service at the end of the month then I am going to put some proper miles on it. Hopefully I can get my Jag sold soon and crack on with both vans. If the weather picks up just a little bit more, I can start doing some sign writing on my little Suzuki Van. I can also start adding the list of modifications that I have planned. 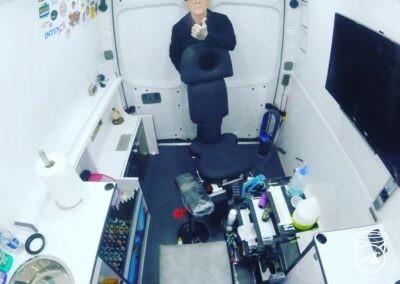 I think it will make a great little van for the pit bike, a cool advert for the business and I would really like to go and stealth camp in Amsterdam at the side of a canal. Talking of which I still have some good availability in the diary. It is not that I am not busy, I am. It is just that I am getting through work so much faster in the Tattoo Race Truck. So I will need a bit of extra skin to fill some blank spaces. Not having a tattoo studio is mind blowing. I am as busy as last year for March but I have so much time on my hands. I have the potential to get so much more tattooing done….. give me your skin! I am also looking for a couple of Tattoo Models. Male, or female. You must be young, hydrated (see above), photogenic and most importantly you must have a decent plan in place for the direction you want to take. Big pieces only, preferably as much of the canvas as possible. I am not interested in people who want to dabble now and again. You must be able to sit for long periods, you must also be fit and healthy with a good physique. I am prepared to put in the hours FOC in order to do some big, impressive pieces in order to show what I can really do. But I need people who are not going to mess me around. 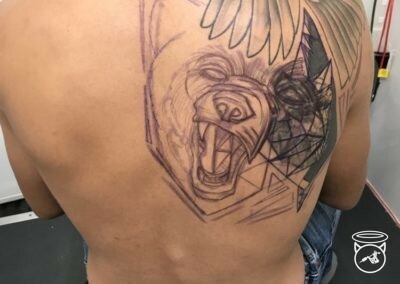 Half a tattoo could cost me 30 or 40 hours of my life but it will be worthless to me if I do not get the finished shots. A strong social media presence will help your cause no end. If you have photography skills that would be a bonus. CLEAN SKIN! Will get preferential treatment, if you have tattoos then clean limbs, I am not interested in tying a lot of tattoos together even if it is my own work. This is an opportunity for someone who really wants to go for it. Promote the studio, make yourself available for photo shoots and conventions when needed. 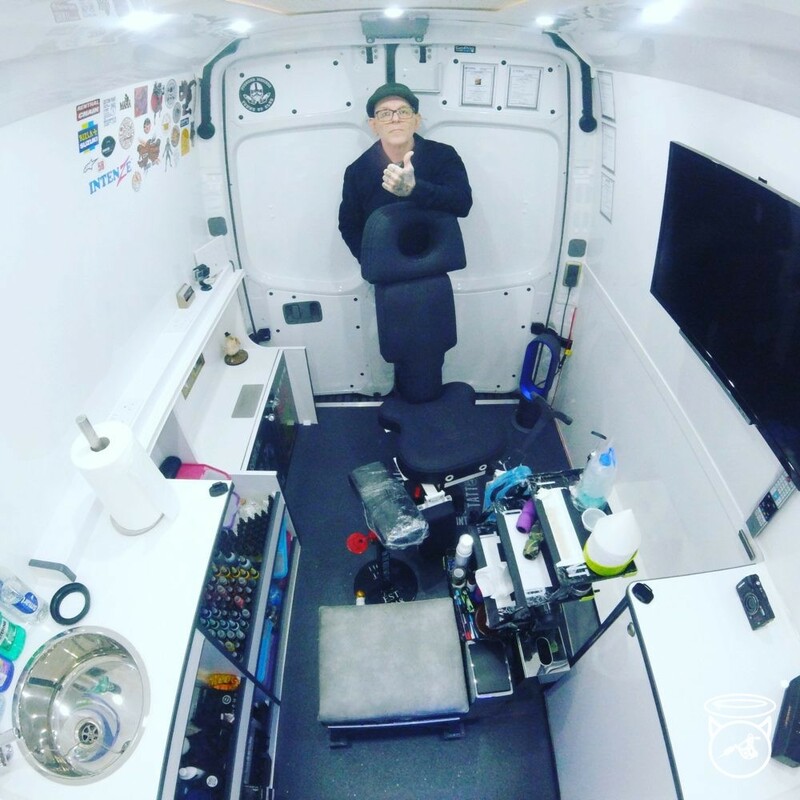 Looks like Rickmansworth will be my next destination, my license covers me to tattoo in the Rickmansworth area, so I guess the news this week is that I am the newest Tattoo Studio in Rickmansworth and possibly the only mobile visiting Rickmansworth Tattoo Studio. See me in Rickmansworth then give me a wave. I actually had Saturday off this week, that was strange. I am sure I could have posted something on the social media account and filled the slot pretty quickly but I decided to stay under cover. I think it is the first Saturday I have had off in a number of years. I did take calls from people looking for “walk ins”. So how do we do a walk in? After considering it for a while: I have decided that the days that I do not have a booking but I do want to work. I will prep myself and the truck and make myself available for “drive-ins” ( you know I had to do that right?). You call, if I am available then pay a deposit online and I will be at your door within 30 minutes. If I am Free to do so. It is usually a booking service that I offer but you never know, it could be fun. The Diary is open, weekends are going fast and evening appointments are popular. This is the ONLY Tattoo Studio that comes to you at a time and place of your choosing. I offer first class tattoos, complete aftercare instructions and honest and upfront advice. And I have been doing so for over 15 years.